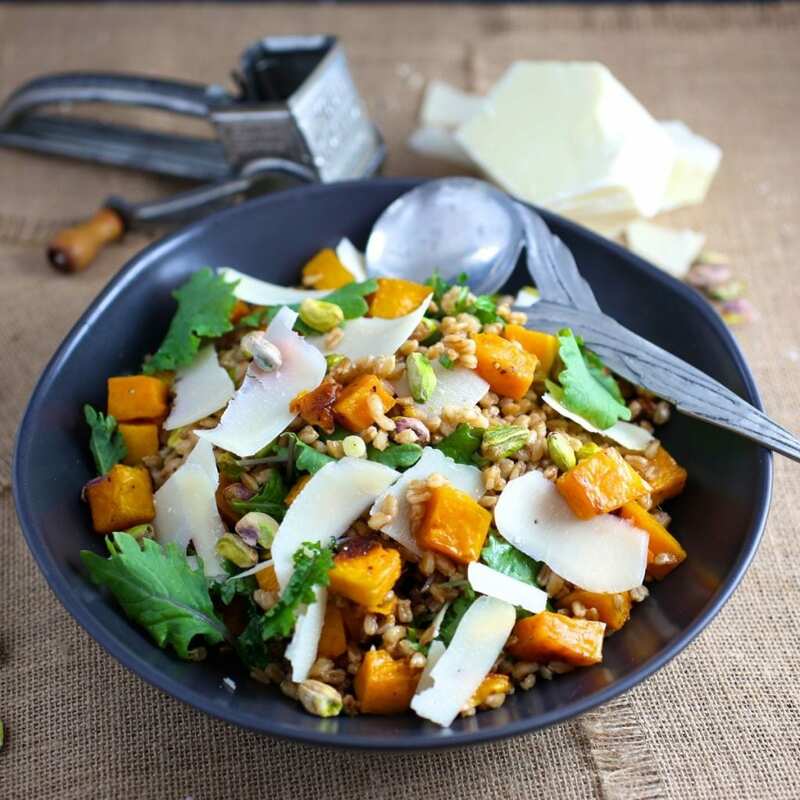 This farro salad with butternut squash and hardy kale lets you imagine it’s actually spring while using up the last of your winter produce. Yay, it’s officially Spring! Also boo, it’s officially snowing. Here in the Hudson Valley we had one fleeting afternoon of warmth but then, like a high school bully who tells you your sneakers are cool so you’ll look down and then flicks you on the forehead, we got sucker punched. Even the chickens were like, “Seriously? We are so over this,” when I went to the coop this morning. Every year I forget that Spring vegetables like ramps and asparagus don’t start to show up at the Farmer’s Market until mid-April at the earliest so right now, it’s mostly the same selection you find in Fall. Which is not a terrible thing when you can get great stuff like butternut squash, apple cider and baby kale. This is a salad that I had planned to make for Thanksgiving but didn’t get a chance to. 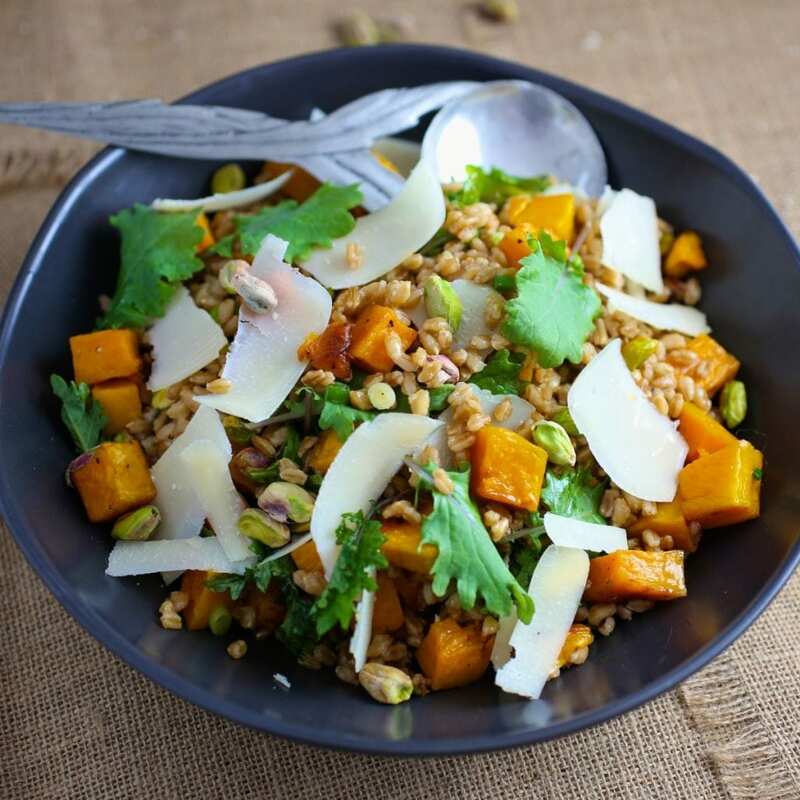 Farro is one of my favorite grains, especially for salads because it holds it’s shape well and doesn’t get soggy even after several days (which means it’s perfect for making ahead of time). 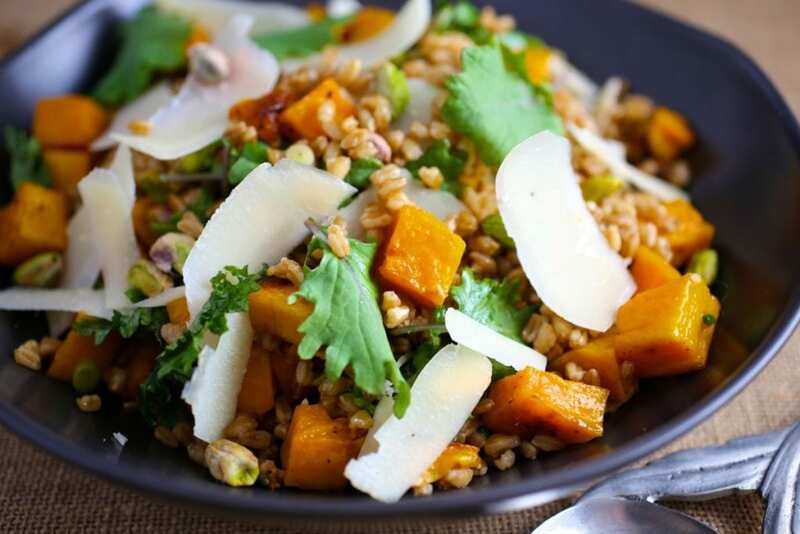 Like all grains, farro doesn’t have a ton of flavor on it’s own so when I read Charlie Bird’s farro salad with butternut squash recipe in the New York Times which calls for cooking it in apple cider, I knew I had to try it. I’m so glad I did, it’s fantastic. I changed some of the other ingredients around but the cider idea is brilliant. (One word of caution, I initially followed the NYT recipe which uses 2 teaspoons of kosher salt in the liquid and it was WAY too salty. So salty that I had to throw it out and start over. I’ve adjusted it below to a 1/2 teaspoon, but even if you use the original recipe, I would keep the lower amount). When buying farro, choose semi-pearled over pearled if you can find it, as it has more bran intact. Farro is supposed to have some texture. It won’t get as soft as rice or couscous. If you don’t have lemon, use red wine or sherry vinegar. You could use any kind of nuts you like. Pecans, walnuts or almonds would all be great. Goat cheese would be delicious as an option to Parmesan. Preheat oven to 375° F. Place the butternut squash onto a sheet pan in a single layer and drizzle with 2 tablespoons olive oil. Sprinkle with kosher salt and freshly ground pepper. Toss to coat and roast for 30-35 minutes, until squash is tender and lightly browned. In a medium saucepan, bring farro, apple cider, ½ teaspoon salt, bay leaves, garlic and 2 cups water to a simmer. Simmer uncovered, until farro is tender but still has some chew and liquid evaporates, about 30 minutes. If all the liquid evaporates before the farro is done, add a little more water. Let farro cool, then discard bay leaves and garlic clove. In a large bowl, whisk together olive oil, lemon juice and a pinch of salt. Add the farro, squash and scallions and mix well. This salad base will keep for up to 4 hours at room temperature or overnight in the refrigerator (bring to room temperature before serving). Just before serving, fold in arugula, nuts and the cheese. Sprinkle flaky salt to taste. 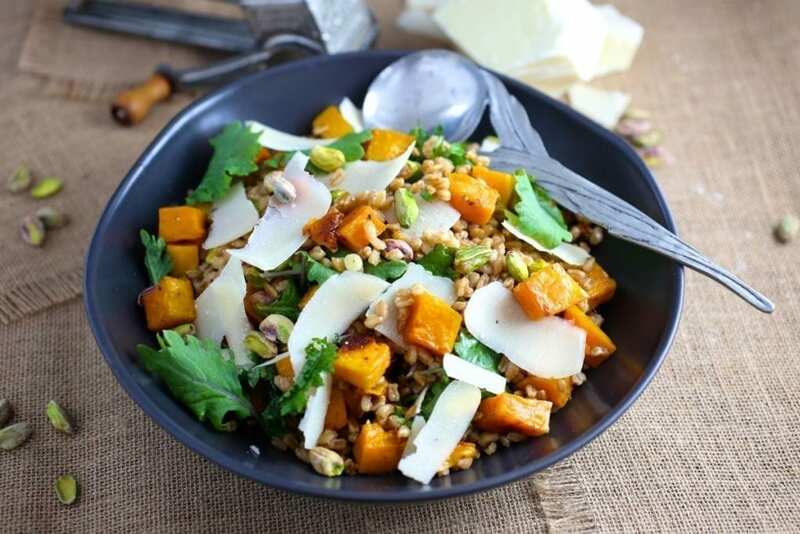 I make salads most nights for dinner and often look for new recipes to create.. so thanks for sharing this farro and pumpkin salad. You can consider I will be making it!